Aviation Safety Indonesia: New Law Means Death Small Indonesian Airlines? CHEEKTOWAGA, N.Y. (AP) - A SkyWest airlines flight to Connecticut was diverted, descended steeply and made an emergency landing in New York on Wednesday after three passengers lost consciousness. The flight, carrying 75 passengers, departed from O'Hare International Airport in Chicago and had been bound for Bradley International Airport in Windsor Locks, Connecticut. It landed at Buffalo Niagara International Airport in Buffalo at about 11:40 a.m.
A SkyWest spokeswoman initially reported that one passenger aboard Flight 5622, operating as United Express, lost consciousness and the pilots rapidly descended "out of an abundance of caution." But in a later statement, SkyWest spokeswoman Marissa Snow said new information from medical personnel confirmed that "a total of three passengers reported a loss of consciousness while on the flight." Mary Cunningham, a nurse at Yale-New Haven Hospital in Connecticut was on the flight. She told WTNH-TV she helped provide medical attention after the first woman passed out. "We got her oxygen and as soon as she got on the oxygen she was alert, she came right back," Cunningham said. "Then I went back to my seat after she was feeling better and they called me right back because the person sitting right behind her passed out." For nearly eight minutes, the plane descended at a very steep incline, dropping as fast as 7,000 feet per minute, flight tracking service FlightAware said. "We dropped so fast that I didn't know what was going to happen," Larry Johnson of Danbury, Connecticut told WTNH. "I thought we were going to have to swim in the ocean or do something. All the movie thoughts are running through your head." SkyWest Inc., which is based in St. George, Utah, earlier had said the jet landed safely and a passenger received medical attention before being released. An additional 15 adults and two children were evaluated upon landing, but none required treatment outside the airport, airport spokesman C. Douglas Hartmayer said. "Anyone who said they didn't feel well was treated at the gate," he said. In an earlier statement, Snow said in an email: "There were no reports before the unconscious passenger prior to the initiated descent, but I can't speak to what may have been the specific cause of their feeling ill."
"The passengers were evaluated by medical responders on the ground in Buffalo and were released; none were transported to the hospital," Snow said. The airline said it was making plans to transport the passengers to Hartford, Connecticut. The Federal Aviation Administration said initial information indicated the Embraer E170 jet may have had a pressurization problem, but that turned out to be incorrect. Snow said the plane's oxygen masks did not release. "After examination by maintenance personnel and local authorities, there have been no indications of a pressurization problem or other issues with the aircraft," Snow said. "Our investigation is ongoing." BOSTON (AP) - Two people on a Delta Air Lines international flight diverted to Boston because of bad weather in the New York area were taken to a hospital after the plane encountered turbulence approaching Logan International Airport. Delta said Wednesday afternoon that "a small number of customers" on Flight 271 Paris complained of nausea and possible minor injuries and were checked out by emergency medical technicians. A Boston EMS spokeswoman said two people were taken to Massachusetts General Hospital with what are believed to be minor injuries. The airline said Flight 271 from Paris left Boston just after 6 p.m. to resume its journey to Newark, New Jersey. The plane is a Boeing 767-300ER. Delta said 180 passengers and 11 crew members were aboard. Tokyo, Japan - Japan on Thursday raised the age limit for piloting a commercial plane to 67, the latest effort in Asia to get to grips with a drastic pilot shortage. The move looks set to make pilots working for Japanese airlines among the oldest in the world. Until now, pilots had to retire their wings at 65. Under Japan's new rules, pilots can carry on flying until their 68th birthday. "We are aiming to ease a shortage while still ensuring safety," a transport ministry official told AFP. Japan has 5,900 airline pilots, including 500 aged 60 or over, according to the ministry. But surging demand from passengers, especially in the booming budget sector, has created a shortage that last year forced airlines to cancel thousands of flights. japan's ANADemographics are expected to exacerbate the problem in the 2030s, when a raft of Japan's captains - now in their 40s - hit retirement age. "The training is so expensive and a lot of (airlines) are paying retirement to pilots as well. If you start flying at 30 years old, you only have them for 35 years," said Ronald Bishop, head of the aviation programme at Australia's Central Queensland University. "All that money they spent making the pilots really safe and making sure they're up to speed and they get the proper training - extending it by a few years helps them get their money back." Australian aviation expert Neil Hansford said globally there was a lack of skilled pilots and the use of older workers was "becoming pretty standardised, except for some of the unionised countries". "Sixty-five is very common now," Hansford added. Greg Waldron, the Asia managing editor of Singapore-based FlightGlobal, a specialist online news and information website, said the high cost of training to become a pilot put off many potential entrants. "The industry is in a bit of tough patch now in terms of bringing in qualified, good individuals to become pilots," he said, adding that the shortage is particularly acute in the Asia-Pacific region. "In countries like the United States and Australia and even Europe, there is... a lot of exposure to aviation," Waldron said. "It is relatively cheap in countries like Australia or the United States to get a basic pilot's licence. It's just a general aviation culture. (But) in Asia Pacific you don't really have that type of activity going on as much." In Japan, a country where the over-65s make up a quarter of the population, the government says it will limit flying time for older pilots to 80 percent of the normal maximum, meaning 80 hours per month or 216 hours over three months. The co-pilot of a 65-plus aircraft commander must be aged 59 or younger, and those who opt to continue beyond their 65th birthday will have to undergo epilepsy tests. Waldron said older pilots did not pose a safety risk. "The key thing is you want these guys to be well-trained, you want them to know how to react when there is an emergency. So if you have an older, more experienced pilot, he might be able to react to things differently compared to someone with less experience," he said. He added it was also important to have consistent, updated training. "As long as they pass the tests in the simulators, as long as they keep performing and prove that they know what they are doing in the plane, I think the retirement age can be pushed up a bit." Hong Hyun Jin didn't care what airline she flew as long as it was cheap. A spate of plane crashes across Asia in the past year changed all that. "I am now scared of flying," said the 42-year-old office worker in Seoul. "Me and my friends are planning a holiday in Phuket, Thailand, but I am picky what airline we should fly." Thailand's air safety has come under scrutiny this year after a United Nations watchdog raised questions about procedures for certifying airlines. That prompted Japan and South Korea to slap restrictions on some flights from the country, which depends on tourism for 10 percent of its gross domestic product. The country has 28 registered airlines, the government says. Thailand's troubles are symptomatic of the rising challenges throughout Asia, where a surge in the number of planes and airlines is threating to overwhelm the infrastructure designed to keep fliers safe. Four airline crashes in which more than 700 people died made 2014 one of the worst years for Asian aviation, including a mystery crash where no debris was found. "Due to the rapid expansion of the industry, some countries may not have been able to cope well with the development in terms of catching up with safety," said Shukor Yusof, founder of Singapore-based consultant Endau Analytics. "There are many, many areas that need to be improved." Visitors to Thailand increased 19 percent in 2013 to 26.5 million, according to the United Nations World Tourism Organization. It's the second-most popular destination in Asia, after China. In a January audit, the U.N.'s International Civil Aviation Organization raised questions about Thailand's safety procedures that prompted Japan to restrict some Thai airlines' operations. ICAO wouldn't spell out details beyond saying there were concerns, primarily relating to air-operator certification procedures. So far a major fallout has been averted. South Korea's Transport Ministry banned Thai charter flights, but left scheduled services intact. Japan, which initially barred Thai carriers from adding or changing flights, will allow charters in April and May and will weigh progress after that. Thailand has shared its action plans with ICAO, the agency's spokesman Anthony Philbin said. "We need to regain other nations' trust," Prime Minister Prayuth Chan-Ocha said in a televised speech April 3. ICAO "is giving Thailand three months to overhaul the system, but I want it fixed within the next 30 days." Equipment will be upgraded, the number of aviation officials will be quadrupled and Thai carriers' licenses will be reviewed in the new plan. "The aviation safety risk will not only affect the airlines but also the number of tourist arrivals to Thailand," said Jintana Mekintharanggur, director of equity investment at Manulife Asset Management Co. in Thailand. Thailand is still in compliance with FAA regulations, according to the agency's website. "The current problem in the Thai aviation industry is very serious," Patee said. A paper-thin carbon-nanotube film that can heat and solidify the composite materials used in aircraft wings and fuselages, without the need for massive industrial ovens, has been developed by a team of researchers in the US. The film can be rolled onto industrial components to deliver uniform, controllable and efficient heating via conduction. When connected to an electrical power source, the heated film stimulates the polymer to solidify. The technique should provide a more direct, energy-saving method for manufacturing virtually any industrial composite, according to the researchers. Large industrial components such as aircraft wings are often made of composite materials that have layers that must be bonded together. Bonding typically involves curing the composite materials at high temperatures in expensive, immobile ovens known as autoclaves. Heating metre-sized components to temperatures of several hundred degrees in autoclaves - large industrial vessels that treat materials using elevated pressure and temperature - is an energy-inefficient process: the ovens waste significant amounts of energy as they themselves must be heated before the thermal energy is carried to the components by convection. The inspiration to use carbon nanotubes (CNTs) as conductive microheaters was based on previous studies, explains Seth Kessler, president of Metis Design Corporation in Boston, a spin-out company from the Massachusetts Institute of Technology (MIT). Together with researchers at MIT's department of aeronautics and astronautics, the team developed a CNT-based microheater that can effectively be rolled over an arbitrary surface to provide direct heating. "We had been using carbon-nanotube-based resistive heating for de-icing applications and had then considered the possibility of using the same principle for curing," he says. The team's "out-of-oven" approach avoids the use of autoclaves entirely, thereby allowing composite materials to be efficiently cured regardless of their size or shape, and irrespective of the availability of a nearby autoclave. Similar microheaters are already commercially available, but the researchers caution that "it's not as simple as just buying material and pushing it on the surface". Rather, significant engineering is required for each curing project to determine the appropriate resistivity and current-flow paths. The researchers, led by Brian Wardle of MIT, first created a mesh of aligned CNTs, where each nanotube was approximately 400 microns long. Aligning the nanotubes ensured better electrical stability, which was critical since current needs to pass through the mesh to provide resistive heating. The group then added a copper mesh to create electrical contacts, and a composite surfacing film to ensure electrical insulation. Wardle and his team tested a roughly postage-stamp-sized sample of the film on a commercial, laminated composite commonly used in aerospace manufacturing. They attached a 30 V power supply directly to the two electrodes of the microheater and manually adjusted the input voltage to modulate the film's temperature to yield a complete cure. "We found about a 1000-fold difference in energy used for curing, resulting in a 50% cost reduction in the final production part," says Kessler. Even though the group only tested a small piece of the mesh, the researchers envision that scaling up the size of the mesh to cover an entire aircraft wing will not present a challenge. "The larger the part, the more opportunity the current has to achieve a uniform front," Kessler notes. "As long as the current flow is intelligently designed, the scale of the part is irrelevant." Furthermore, the extremely low surface density of the films (5-10 g/m2) means that they can be simply left on the material after curing without worrying about the extra weight. Kessler told physicsworld.com that by leaving the films in situ, other multifunctional capabilities may be realized, such as damage-detection based on resistance changes. As different composites require different temperatures in order to fuse, the researchers also tested how hot the CNT film could actually get before it failed. The team found that the film's failure point was at more than 537 �C. In comparison, some of the highest temperature aerospace polymers require temperatures up to 399 �C in order to solidify. "We can process at those temperatures, which means there's no composite we can't process," Wardle says. "This really opens up all polymeric materials to this technology." The researchers are now working with industrial partners to find ways to scale up the technology to manufacture composites large enough to make airplane fuselages and wings. The research is described in Applied Materials and Interfaces. A Mokulele Airlines flight from Maui to Hawai'i Island was forced to turn around and glide back to the Kahului airport Wednesday morning after reported engine failure. One of the passengers on-board, John Harding, says he's been flying with Mokulele Airlines along that same route about twice a month for the past four years -- and he could tell as soon as they were in the air that something was wrong. "We took off and all is normal as usual but all of a sudden the engine started making a few noises and it just didn't sound right. The pilot looked back at us and said that we need to get back to the airport and make a landing and with that the engine cut off entirely, the propellers stopped moving -- and as you know Mokulele only has one propeller -- so with that we started a radical descent and he did a big sweeping turn and luckily we were close enough to the airport still that we were able to make the runway," described Harding. Harding says emergency personnel were on the ground waiting for them when they landed, but fortunately, no one was hurt. "We glided back to the airport safely thank God. We were literally gliding. If we'd been another 15 - 20 minutes into the flight and over the ocean we would've ditched into the ocean, there's no doubt about it," Harding said. An FAA investigation is underway. "A single-engine Cessna 208 operated by Mokulele Airlines returned to Kahului right after departure due to an engine problem. The captain declared an emergency and the aircraft landed without incident at 9:35 a.m.," said Ian Gregor, the Public Affairs Manager for the FAA Pacific Division. Harding says he was re-booked on another flight three hours later and was a little apprehensive about getting on-board, but needed to get to his mother. "This was quite a traumatic experience because if we would've been a little further away from the airport we wouldn't have made it back to the airport. The pilot himself said that and when we hit the ground the pilot and co-pilot shook each other's hands and congratulated each other on how remarkably safe a landing they made, because they were visibly shaken about the incident too. I know mechanical failure happens, but when you drop out of the sky like that and nobody knows about it it's kind of alarming," described Harding, who says he's not sure he'll fly with Mokulele again after "cheating death" but commended his pilots for their professionalism. Mokulele Airlines' General Manager Darryl Grace confirms there was a precautionary landing at the Kahului Airport Thursday. "The pilots followed their procedures and landed the aircraft without any incident," Grace said. Small Indonesian airlines face difficult times ahead of the implementation of a new law (UU No. 1 2009 on Aviation) which stipulates that per 1 July 2015 all Indonesian airlines have to operate at least ten aircraft. Of this ten airplanes, at least five aircraft have to be owned by the airline, while the remainder can be leased. The Indonesian government emphasized that if domestic airlines fail to comply with the new law per July 2015, then their flight permits will be revoked. Obviously, this new law forms no threat to the country's main airlines including Garuda Indonesia, Lion Mentari Airlines, Sriwijaya Air, Citilink Indonesia, and AirAsia Indonesia, which all own dozens if not more than 100 aircraft. However, there are also about 45 domestic airlines that fail to meet the requirements of the new law. On average these smaller airlines only operate three to five airplanes. For example, Aviastar Mandiri is one of these smaller Indonesian airlines which currently only operates seven aircraft. The owner of this airline, Sigit Sudarmaji, requested a judicial review of the new law at the country's Constitutional Court as he considers the law as a form of discrimination. Only the larger companies can afford to comply with new rules. The smaller ones, on the contrary, loose the opportunity to establish and expand their business. Being the world's largest archipelago and having many small airports in the more remote regions (where larger aircraft cannot land), Sudarmaji claims that it is vital for inter and intra-connectivity to foster small airlines in the regions. The Court is scheduled to give its ruling on the matter in mid-April. To make matters worse, the implementation of the new law comes at sluggish economic times. Although the aviation industry in the Asia-Pacific (and especially Indonesia) still has promising perspectives on the longer term, people's weaker purchasing power impacted on the aviation industry. Moreover, Indonesian airlines feel financial turmoil due to the depreciating rupiah against the US dollar (about 70 percent of airlines' operational costs are US dollar-denominated). This means that the timing is far from ideal to invest heavily in new aircraft. A new aircraft will cost about USD $25 million, while a used aircraft can still cost up to USD 5 million. The Indonesian National Air Carriers Association (INACA) also stated that the new law is harsh for the small Indonesian airlines in the regions that tend to operate local flights only (from city to city) and agrees that the new law should be revised (specifically the minimum aircraft ownership requirement) in order to provide room for these smaller airlines to exist. From the perspective of the Indonesian government the reason behind the new law is clear: curb the amount of domestic airlines (while at the same time boosting the amount of domestic airplanes) in order to enhance monitoring of the country's aviation industry. Given that smaller airlines that are dependent on limited flights in one particular region are more vulnerable to financial turmoil, safety becomes an issue. The government advises those airlines that cannot comply with the new minimum aircraft requirement to engage in mergers or change their permits from 'scheduled commercial flights' to 'non-scheduled commercial flights'. Canada-based International Air Transport Association (IATA) has repeatedly expressed its concern about safety in Indonesia's aviation industry. At least one air crash has occurred in Indonesia every year since 2010. Therefore, the country needs to upgrade its air traffic management system, particularly as Indonesia has to cope with a rising number of aircraft in the skies. IATA advises that the Indonesian government should put more effort in updating regulations and infrastructure in order to keep pace with expansion of Indonesia's air traffic. The country's air travel market is expected to triple over the next 20 years to 270 million passengers. The aviation industry in the Asia-Pacific region is one of the world's fastest growing regions in terms of air travel. Indonesia, Southeast Asia's largest economy, contains a burgeoning middle class that is increasingly using airplanes for domestic and international transport. Being the world's largest archipelago that is home to 250 million people, air travel is the easiest option for fast travel across the country. 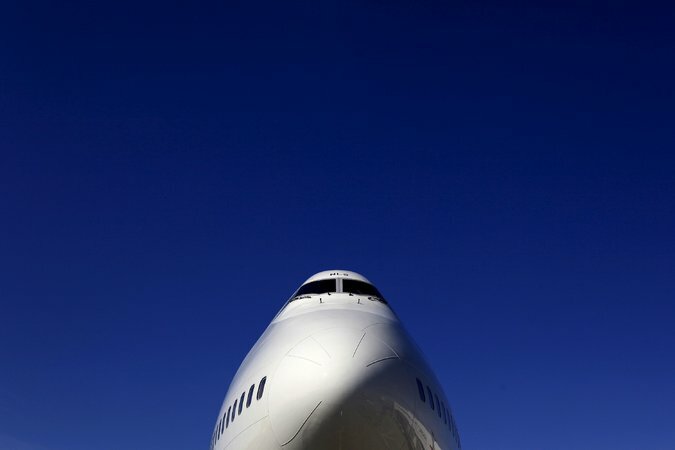 A Boeing 747 at Heathrow Airport in London. Demand for Boeing's 787s has still been strong. Boeing's stock fell by 1.4 percent on Wednesday after the company reported that it had generated less cash in the first quarter than most analysts had expected. Boeing described the drop in its cash flow as temporary, but analysts said the problem showed that the company was still not making money on sales of 787 Dreamliners, the fuel-saving jets it introduced in 2011. "Boeing has been relentlessly steering investors to look at the cash flow rather than the earnings performance," Robert Stallard, an analyst at the Royal Bank of Canada, wrote in a note to clients. "Boeing is perhaps learning the hard way that if you tell investors to focus on the cash flow, then you had better deliver it," he added. The Chicago-based company said that its operating cash flow slid 92 percent in the first quarter, to $88 million from $1.11 billion a year earlier, partly because of the timing of certain receipts and expenditures. Including capital spending, its free cash flow was negative $486 million, compared with $615 million a year earlier, the company said. Still, Boeing executives reiterated that they expected to start making a profit on each Dreamliner delivery later this year. They also reaffirmed that they expected operating cash flow to top $9 billion for all of 2015, up from $8.86 billion in 2014. Dreamliners are the first commercial planes made substantially of lightweight carbon composites, and Boeing has invested heavily in them. Gregory D. Smith, Boeing's chief financial officer, said the deferred production cost for the 787 program rose by $793 million in the first quarter, to $27 billion. He said the total would continue to rise by similar amounts for the next two quarters. Deferred production cost accounts for the gap between what it costs the company to build each plane and the average cost it has projected for the first 1,300 aircraft. Under an accounting method that Boeing has long used, it can book profits on aircraft sales now against that average projected cost. But it has to keep a running tally of the additional cost of each plane as the deferred cost total. Mr. Smith reiterated on Wednesday that after Boeing increases its production rate for the jets to 12 each month in 2016 from 10 now, the deferred cost total should begin to decline fairly rapidly. He said recent delays in receiving seats for the 787 from a French supplier, Zodiac Aerospace, had added to the costs of the program. Boeing also has an aggressive stock repurchasing program, spending $2.5 billion to buy back 17 million of its shares in the first quarter. The company said its core operating earnings, excluding pensions and other costs, increased by nearly 2 percent in the first quarter to $2.13 billion. The core earnings rose 12 percent on a per share basis, to $1.97. That topped the estimates of analysts polled by Thomson Reuters, who had expected $1.81 on average. Boeing's quarterly revenue climbed 8 percent, to $22.15 billion, from a year earlier. With the demand for new planes remaining strong, Boeing said that it expected core earnings of $8.20 to $8.40 a share for all of 2015 on revenue of $94.5 billion to $96.5 billion. A few months ago, Gui Yue, China sales director of jet acquisition specialist Aviatrade Asia, received a call from a Beijing client who hoped to buy a pre-owned business aircraft. "We rarely received such requests before 2013. In the past, Chinese buyers only wanted new ones," said Gui. "But there are more billionaires saying they are interested in second-hand aircraft in recent years." The Beijing client, who runs a real estate company in the capital city, finally selected a three-year-old Dassault Falcon 7X owned by an Eastern European seller among the four options offered by Gui's team. Having engaged in jet deals for years, Gui has detected subtle changes in the attitudes of Chinese buyers. "In the past, people just wanted to show they were rich enough to afford a private jet like other billionaires," he said. "But now buyers are becoming more mature and practical and are realising the advantages of a pre-owned airplane." A second-hand private jet market has emerged in China in the past two years. According to Asian Sky Group, a Hong Kong-based business aviation service firm, the number of business jets rose by 59 last year to 439 in the Greater China region, which includes the mainland, Hong Kong, Macau and Taiwan. Pre-owned aircraft represented 27 per cent in the additions to the Greater China fleet during last year. "For most buyers, pre-owned aircraft are attractive because of their availability and pricing," said Jeff Lowe, Asian Sky Group's managing director. In today's aviation industry, it can take up to two years to deliver a tailor-made business jet once an order is received. Buyers who order, for example, a popular aircraft such as a Gulfstream G650, would be lucky to take delivery of the before the end of 2017. Not only is this time-consuming, but also leads to higher costs of capital since the buyers need to prepay tens of millions of dollars to the manufacturer. But, in most cases, pre-owned jets can be delivered in one or two months, Lowe said. Getting a bargain is also an important reason for Chinese buyers to consider a pre-owned jet. "As a very general rule, a business jet depreciates about 5 per cent a year. Of course, that depends on how much it's been used and what the market is like," said Lowe. Indeed, the market sentiment in the mainland has been sluggish in the past two years due to economic uncertainty and the government's anti-corruption crackdown, which has affected both new and second-hand aircraft deals. The private business jet fleet in the country grew by 41 aircraft in 2014, compared with 55 in 2013 and 60 in 2012. While there were fewer mainland buyers last year, the number of domestic sellers is rising. "Some Chinese buyers, who bought their jets four or five years ago, are starting to sell their aircraft while they look for replacements or move them out of China," said Lowe. The veteran aviation industry consultant said many Chinese billionaires bought business jets "out of impulse" years ago and are now looking for replacements more suited to their needs. Acquiring a new or used business jet is not as straight forward as say buying a car. A seller of a pre-owned aircraft first needs to provide information and pictures to prospective buyers. If the buyer shows further interest, the two parties sign a letter of intent in which they agree on a price. The buyer then pays a deposit to a third party for an exclusive right of purchase. However, Gui said, it is not uncommon for mainland clients to sign letters of intent even when they no intention of buying the aircraft. "They do so just to know much the seller is asking for his plane. But this undermines the buyer's credibility and affects other deals he may undertake in future." Many Chinese jet owners also do not know how to maximise their plane's value and cannot provide full information including the date of manufacture, flight data, maintenance records or even pictures. "An entrepreneur once asked us to help sell his jet. When we asked him for a jet picture, he just messaged us a blurred photo taken on his smartphone," Gui said. In mature markets like the United States, nine out of 10 private jet deals are second-hand deals, Gui said. "Although demand for private aircrafts in China has been suppressed by the anti-corruption campaign for now, this market is far from saturated and the potential demand is huge. We expect to see a recovery as early as next year ," he said. The 100-hp Gemini 100, intended for light sport aircraft, will be the first in the new Gemini engine family to be fielded by Superior Aviation. FAA certification of the $24,900 powerplant is expected later this year, with initial deliveries slated for early 2016. Superior Aviation Group acquired the Gemini diesel engine and plans to develop 100- to 600-hp versions of the powerplant, the company announced yesterday at Sun 'n' Fun 2015. The 100-hp Gemini 100, intended for light sport aircraft, will be the first in the new engine family to be fielded by Superior. FAA certification of the $24,900 powerplant is expected later this year, with initial deliveries slated for early 2016. Superior CEO Tim Archer said that because of its "uniflow" design featuring two opposing pistons per cylinder, the three-cylinder Gemini 100 will be smaller than many current 100LL and diesel piston aircraft engines, giving it a power-to-weight ratio advantage. The Gemini 100 is currently running in the test cell," Archer said. "It is meeting all of our performance goals and right now we anticipate having pre-production engines within 90 days." The Gemini 100 has a similar profile to the Rotax 912. Superior's Gemini diesel family engines will be able to burn jet-A and have a mechanically simpler design with fewer moving parts, the company said. The company also projects that the Gemini powerplants will have up to 20-percent lower fuel burn than conventional aircraft engines.